More delightful than an actual cupcake! The last family birthday you and your bundle of joy attended was a lot of fun, but when it came time to dive into the cupcakes, your little one encountered some difficulties. It all makes sense though! It must be difficult to properly gobble down a cupcake when you don't have any teeth. Your baby is working with just gums, so most of the pink frosting ended up on her nose and the bottom half of the cupcake was smeared all around her mouth. Did any of the cupcake even get eaten? Who knows, it's hard to say but what's certain is that it was a huge mess to clean up! Are you going to rethink feeding your infant a cupcake again? Probably, but you definitely shouldn't reconsider dressing your baby up in this cupcake cutie costume for Halloween or whenever there's a family birthday or celebration. It's the perfect costume for tykes who can't quite eat the tasty dessert without the assistance of an adult. The convenient onesie has a hook and loop fastener in the back as well as snaps in the crotch for easy diaper changes, but the cute attached skirt hides it all. The collar is made to look like fluffy pink frosting decorated with bright-colored sprinkles and fastens with ties in back. Finally, the stretchy headband features a girly pink rosette and a bright red cherry. 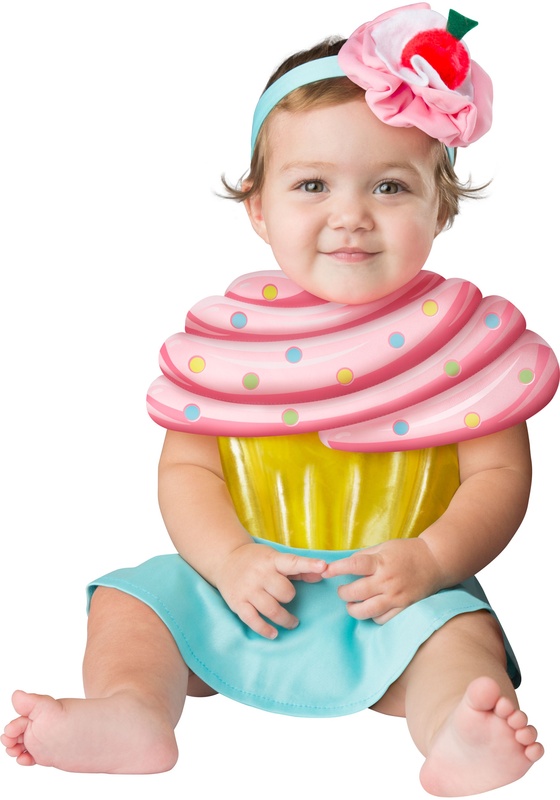 No matter how scrumptious the birthday cupcakes taste, this adorable costume will surely outshine the yummy treats! This adorable cupcake outfit was perfect! Size, quality, headband - everything worked out great for my 13-month-old. The swirl top fits over the sleeveless suit so she wore a long sleeve white onesie which looked great. So cute!